The Attack Democrat--Nothing Conservative Here: 2011-- A GOOD year for Obama and the Democrats? 2011-- A GOOD year for Obama and the Democrats? Ezra Klien has an interesting take on how 2011 is playing out for Obama and the Democrats. With all of its problems, says Klein, 2011 may turn out to have been a really good year for Obama and the Democrats and a really bad year for Republicans. In particular, says Klein, Republicans have totally failed when it comes to their often stated goal of protecting millionaires from tax increases while obtaining deficit reduction largely or totally through cuts in federal spending, particularly cuts in spending on social programs they detest. Four times this year Republicans went head-to-head with the White House and Democrats over using spending cuts to cut the federal deficit instead of raising taxes. In February they threatened to shut down the government over the issue. In August, they threatened to not raise the debt ceiling and let the country go into default because of the spending cut/taxes debate. In November, they demanded that the supercommittee cut the deficit without raising taxes. And just recently, they have demanded major spending cuts rather than tax increases on millionaires to pay for extending the payroll tax cut and unemployment insurance. Each time they fell short of their goal. Republicans ended the year with their worst-nightmare outcome. Rather than reducing the deficit through a combination of $4 in spending cuts for every $1 in tax increases, they are ending with the very likely prospect that there will be $4 in taxes increases for every $1 in spending cuts. 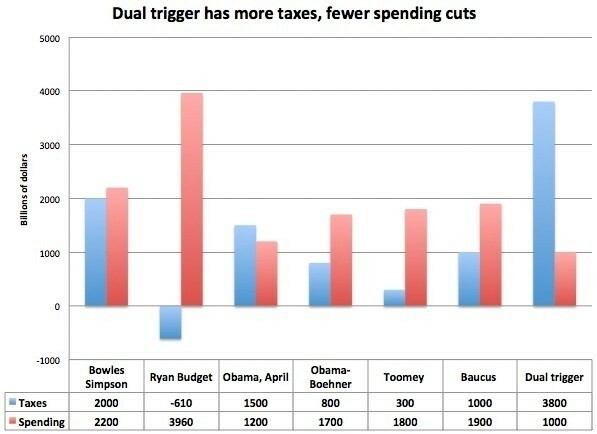 Klein provides the following chart which compares the Republican-preferred Ryan Budget to five other proposals, each of which Obama was willing to support, with what the Republicans got—the Dual Trigger. If the Republicans had accepted any of the five proposals Obama could have supported and gotten Democrats to support, the Republicans would have largely achieved their goal. Millionaires would not pay more taxes and spending on many social programs Republicans hate would have been cut dramatically in the name of deficit reduction. However, Republicans could never say YES. Every time they got close to winning, they asked for more. Ultimately, they lost. Obama and the Democrats won not because they were so smart but because Republicans were so incapable of accepting victory. That’s what happens when the ideological extreme takes over a party.